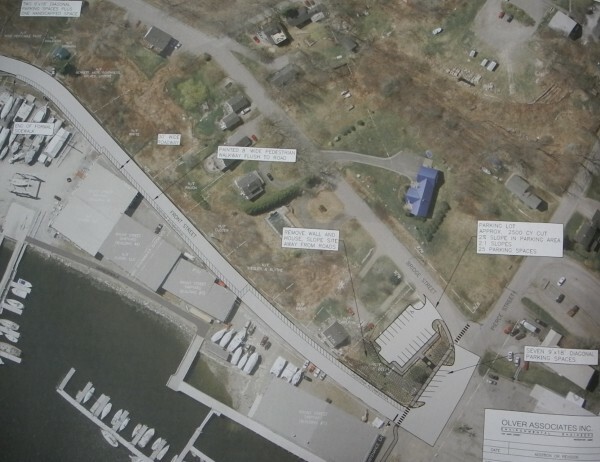 This photo shows some of Belfast's plans for its $3.8 million Front Street reconstruction project. BELFAST, Maine — Beginning this spring, the city of Belfast will embark upon a $3.8 million reconstruction project on Front Street that aims to modernize antiquated infrastructure and rebuild the road. According to Marshall, city officials have set their sights on fixing Front Street for some time. The road runs along part of the waterfront and has seen a significant increase in traffic — including massive trailers towing yachts — since the Front Street Shipyard moved in a few years ago. But the desire to fix the problems predates the shipyard, he said, and officials have known the water line needed replacing as long ago as 1998. However, the fact that the shipyard came to the city and now has a big presence on the road meant that the city was able to win a $1.9 million grant from the U.S. Economic Development Administration to pay for a lot of the work. The Belfast Water District will contribute about $600,000 to replace the water line and the city will pay roughly $1.3 million for everything else, with most of the city’s share coming from the downtown tax increment financing district, Marshall said. When the project is finished, Front Street will have new storm drains, new sewers, new culverts and new water lines, and the road will have been reconstructed to a higher standard. The section of the road that extends from the water treatment plant to Pierce Street will be rebuilt to handle 200-ton loads, much more than the usual city standard, Marshall said. While a typical Belfast road has three inches of hot top, that section of Front Street will have five. “We’re going to a high standard to support the type of load that may be going on the road,” he said. Additionally, the project will address pedestrian and parking issues in the area. The city will install a sidewalk on the road that ultimately will extend from the public restrooms near lower Main Street to the Belfast Yards, the new name the city has given the former Belfast Maskers’ building area. The building was demolished in mid-October, and city councilors have indicated they would like to reserve the newly cleared property for smaller-scale commercial development. “The city wants to have an area with a little different character,” Marshall said. Plans to increase parking include replacing the parallel parking spaces by the water treatment plant with diagonal parking spaces, allowing for about 20 new spaces, Marshall said. The city also will create new parking spaces where Pierce Street meets Front Street by removing an empty house and a small garage there. Officials plan to regrade the steep hillside to make the area safer for both pedestrians and vehicle traffic. He said that work on the project largely will be completed by the end of next fall, with some cleanup work to be done in the spring of 2017.